This Nov. 19, 2017, file photo shows Tyler Hubbard and his wife, Hayley, in Los Angeles. The couple announced Dec. 24 that they welcomed their first child. 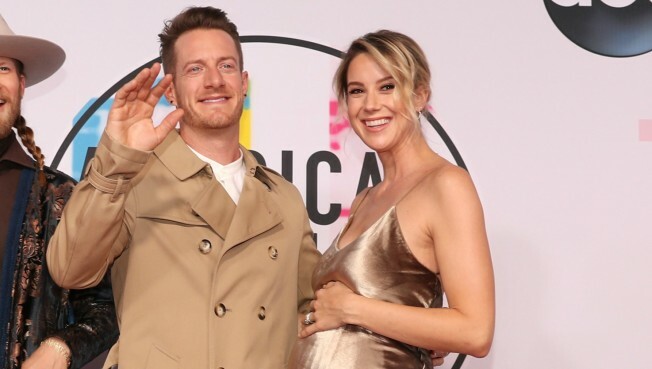 Florida Georgia Line singer Tyler Hubbard and his wife, Hayley, announced Dec. 24 that they received an early Christmas present: a baby girl. The first-time dad took to Instagram to share the exciting news and the baby's first photos, revealing her name, Olivia Rose. "I had no idea I could love somebody as much as I love @hayley_hubbard but last night God gave us Olivia Rose and melted our hearts," he began. "We love this little girl more than words can describe and it hasn't even been 24 hours yet." He continued, "Our life has been forever been changed for the better...I can't wait to share more photos with y'all. I'll try to contain myself from being the annoying parent that post 50 pics a day but I've already taken over 100 so forgive me." People also chatted with the new dad about the exciting news. "We're so overwhelmed with joy and already more in love than we could have ever imagined with this little angel that God has given us," he told the publication. "Olivia is the best Christmas gift we could have ever asked for." Hubbard and his wife first announced their pregnancy news in June, when they thought they were expecting a little boy. However, come August, they discovered it was actually a little girl. "Gods got jokes......After thinking we are having a boy for the last few months, turns out the blood test was wrong and we're actually having a little girl," the country music star shared on Instagram. "Woe... so many emotions but really really excited about this next chapter even if God does like throwing us a curve ball every now and then. Just keeping us on our toes. #daddysgirl"
Shortly after announcing their pregnancy, he told E! News, "I'm pretty stoked. I'm just really excited that we can officially talk about it now and get it out there and not have to keep a secret anymore." It's a free-for-all as Aaron Paul, Florida Georgia Line, and Tig Notaro compete in a tense game that puts an adult twist on musical chairs.